Best Curcumin C3 Complex with BioPerine by Doctor's Best is easy to take and helps me with inflammation. Best Curcumin C3 Complex with BioPerine was originally prescribed by my Integrative Medicine physician a couple years ago. Must be good if he prescribed it. May Benefit the Joints by Helping Neutralize Free Radicals! 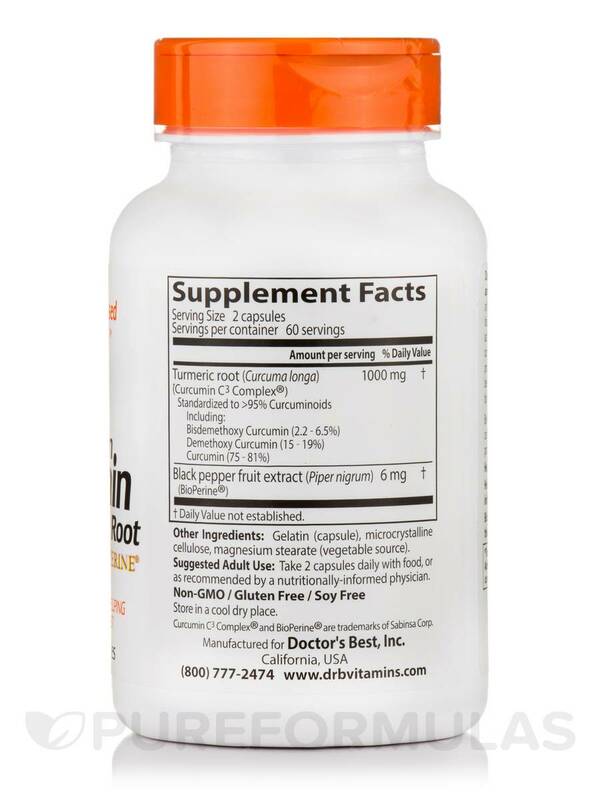 Doctor’s Best Curcumin C3 Complex® is a potent antioxidant that protects cells and tissues by fighting free radicals. It is also proven to support healthy joint function. Curcumin C3 Complex® contains a standardized extract of Curcuma longa root and supplies 95% total curcuminoids‚ including curcumin‚ bisdemethoxy curcumin and demethoxy curcumin. 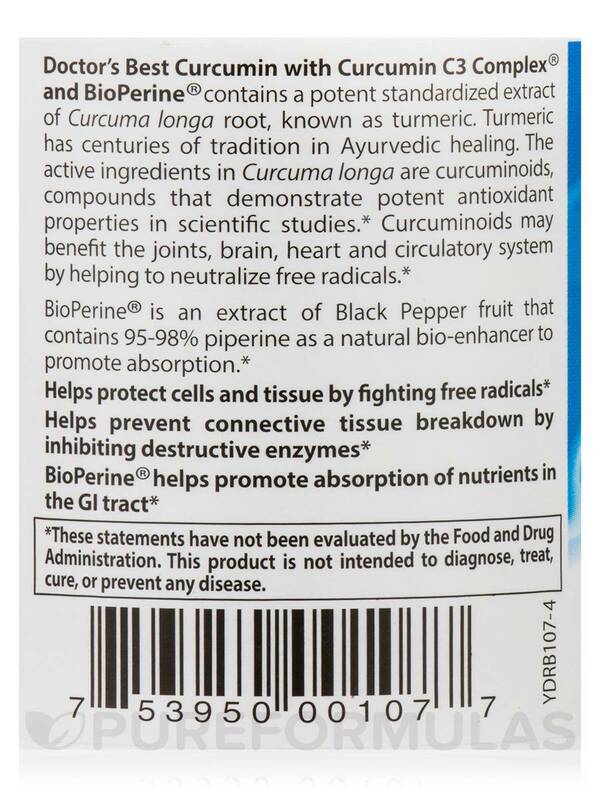 As curcumin is difficult to absorb Doctor's Best add‚ BioPerine®‚ an extract of Black Pepper fruit that contains 95-98% piperine‚ as a natural bioenhancer. Other Ingredients: Gelatin (capsule)‚ microcrystalline cellulose‚ magnesium stearate (vegetable source). Take 2 capsules daily with food‚ or as recommended by a nutritionally informed physician. 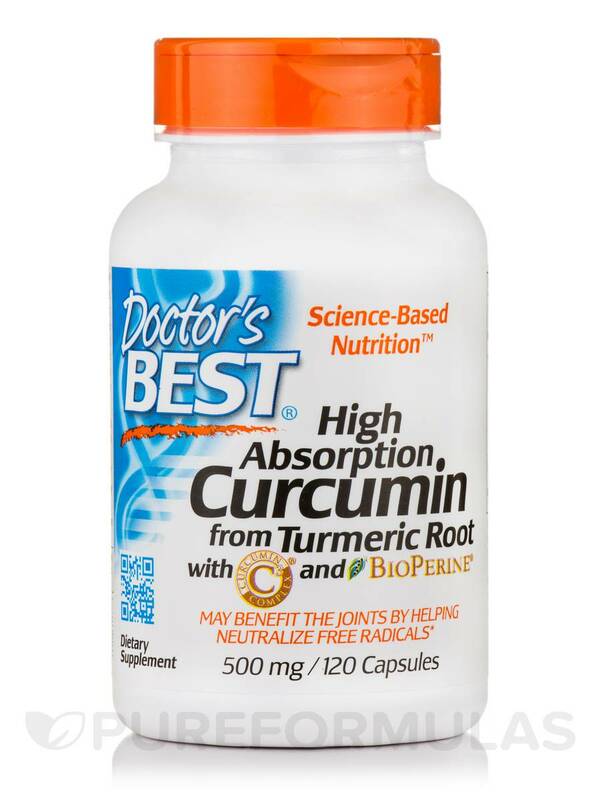 PureFormulas has the best deal I have found for the price of Best Curcumin C3 Complex with Bioperine 500 mg by Doctor's Best. This has many capsules, and for absorption having bioperine, high mg, and 3 complexes of curcumin. Seems to be working for joint pain and concentration. I am also taking for prevention of alzheimers and cancer. This Really is The Best Curcumin! Aside from it's many benefits of reducing long standing inflammation, etc., Best Curcumin C3 Complex with BioPerine by Doctor's Best is also at a very good price. I compared it to another similar curcumin product which had almost identical ingredients, source and strength but was twice as much! Thank you Doctor's Best!! Reduces inflammation and stiffness....and at a great price! 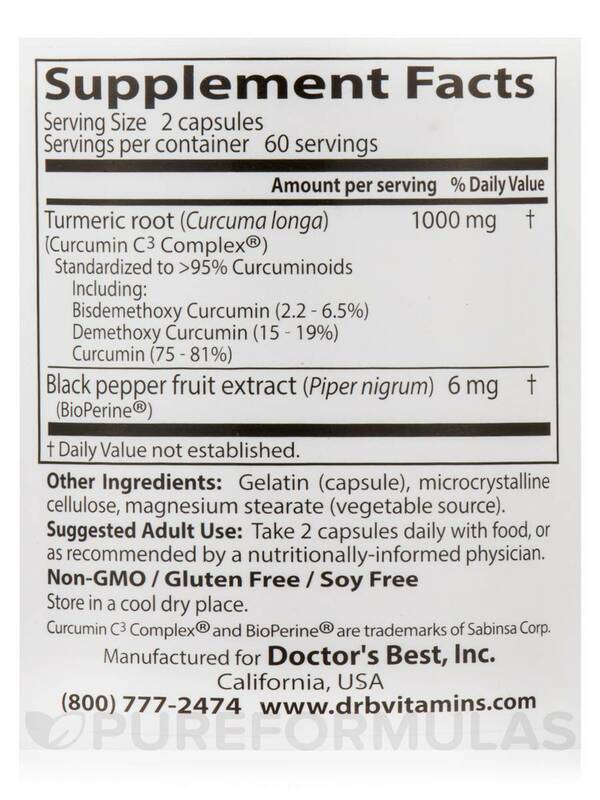 I take Best Curcumin by Doctors Best every day. Many studies show that curcumin (the active component of the spice turmeric) is one of the most potent anti-inflammatory sources available, and there are ongoing clinical trials at such prestigious institutions as M.D. Anderson Cancer Center studying the effects of curcumin on cancer. It is a great supplement to take daily. I love this product because it works. One pill, 3 times a day helps with the pain and stiffness in my joints. I like that the product works. It takes away 95% of the pain & stifness in my joints. I loved finding Best Curcumin C3 Complex with BioPerine - especially on sale! Its not always easy to find Best Curcumin C3 Complex with BioPerine. This has both. Not as much Bio-perine as another brand Ive taken and normally a bit pricy. Best Curcumin C3 Complex with BioPerine has lots of benefits one including antioxidant activity. 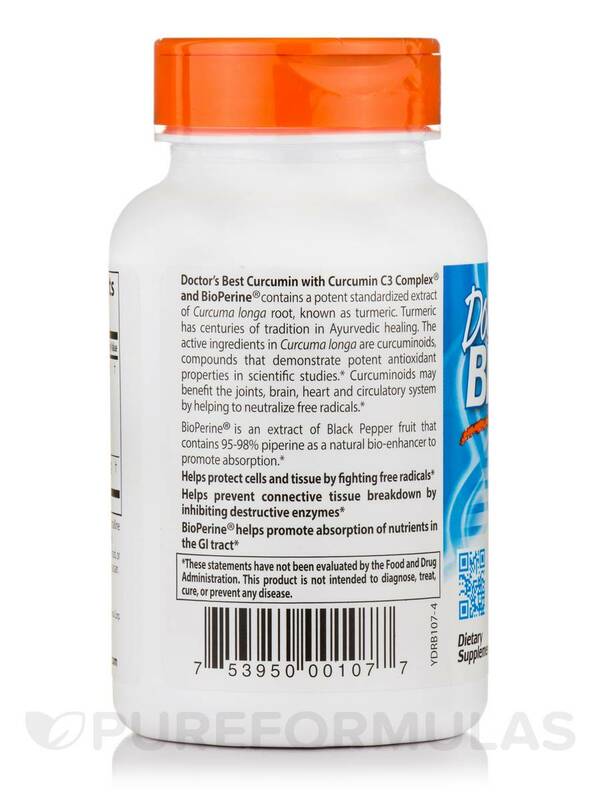 Hi Cecil, we currently still carry the Best Curcumin C3 Complex with BioPerine 1000 mg 120 tablets (Item# DRB1009). Hope this helps. Have a happy and healthy day! Hi Gwen, we apologize but here at PureFormulas, we cannot make recommendations for our customers because there is so much to take into consideration when doing so. Everyone breaks down, absorbs, and reacts to nutrients differently, and only your healthcare practitioner, that is familiar with your needs, would be able to make a recommendation that is the best for you.